The 2018 edition of the study “The World of Organic Agriculture” (data per end of 2016) published by FiBL and IFOAM – Organics International shows that the positive trend seen in the past years continues: Consumer demand for organic products is increasing, more farmers cultivate organically, more land is certified organic, and 178 countries report organic farming activities. The survey is supported by the Swiss State Secretariat for Economic Affairs (SECO), the International Trade Centre (ITC), and NürnbergMesse, the organizers of the BIOFACH fair. The market research company Ecovia Intelligence estimates that the global market for organic food reached 89.7 billion US dollars in 2016 (more than 80 billion euros). The United States is the leading market with 38.9 billion euros, followed by Germany (9.5 billion euros), France (6.7 billion euros), and China (5.9 billion euros). In 2016, most of the major markets continued to show double-digit growth rates, and the French organic market grew by 22 percent. The highest per capita spending was in Switzerland (274 Euros), and Denmark had the highest organic market share (9.7 percent of the total food market). 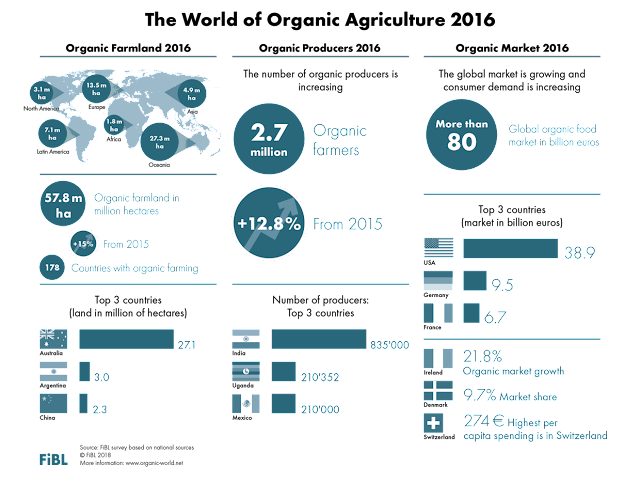 In 2016, 2.7 million organic producers were reported. India continues to be the country with the highest number of producers (835’200), followed by Uganda (210’352), and Mexico (210’000). A total of 57.8 million hectares were organically managed at the end of 2016, representing a growth of 7.5 million hectares over 2015, the largest growth ever recorded. Australia is the country with the largest organic agricultural area (27.2 million hectares), followed by Argentina (3 million hectares), and China (2.3 million hectares). Almost haft of the global organic agricultural land is in Oceania (27.3 million hectares), followed by Europe (23 percent; 13.5 million hectares), and Latin America (12 percent; 7.1 million hectares). The countries with the largest organic share of agricultural land of their total farmland are the Liechtenstein (37.7 percent), French Polynesia (31.3 percent), and Samoa (22.4 percent). In fifteen countries, 10 percent or more of all agricultural land is organic, a new record.